Rogers Pass may be the best scrambling area I have found in North America. 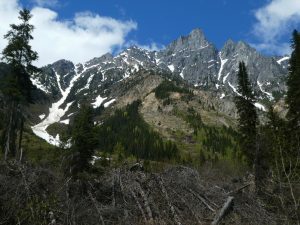 I drove over from the Rockies with grand plans, but discovered when I got there that conditions were completely wrong, and that my plan was better suited to mid-summer. Wanting to get something out of the time spent driving, I looked around and selected Mount Tupper’s west ridge, a classic 5.3 scramble accessible in early season via one of the many avalanche chutes menacing the Pass. With a late start, conditions were near-perfect: just soft enough to kick steps in trail runners on the way up, and soft enough to plunge-step and boot-ski on the way down. The 6-hour outing was far less ambitious than what I had planned, but it was a fun route, and a step toward cleaning up the peaks near the pass. Thinking (incorrectly) that the lower slide path might be a mess of downed timber and alder, I parked at the Hermit Meadows trailhead, then hiked up a road labeled “KEEP OUT” and into the adjacent, fairly open woods. I eventually realized my error, and bashed through a hundred yards of alder to reach the snow-tongue a few hundred feet above the road. 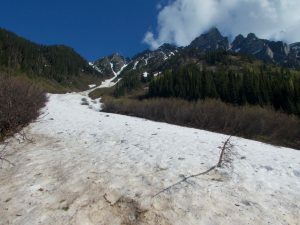 Unlike the normal snow lying around, which was isothermal and wretched after days of above-freezing temperatures, the slide snow was nicely compacted, easily climbable with nothing more than trail runners and an ice axe. I alternated between the main runnel and the snow to either side, then moved to the third class rock and mud higher up, when it seemed easier to do so. I was in no hurry, and the chute climbs over 4000 of the 5000 feet between the road and Tupper’s summit, so it took me awhile to reach the ridge, where I topped out to find a bit of trail and some recent boot-prints in the intermittent snow. Being south- and west-facing, the route was mostly dry, and I crossed only two short patches of snow on my way to the summit. The ridge started out as an easy boulder-hop, then turned to a few fourth class steps as it neared the obvious headwall. 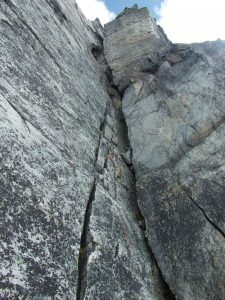 The guidebook mentioned several ways to get up the 40-foot headwall, all low fifth class. At random, I chose to climb straight up the corner/chimney, finding secure climbing after a bit of a tricky start. I had expected things to be easy above that, but there remained some very exposed class 3-4 climbing on the crest. The rock on the final part was blocky quartzite, much like that on Sir Donald, so the climbing was always secure, even when steep. 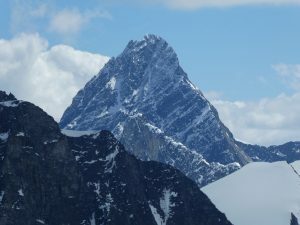 Perched directly above the road and Connaught Creek, the summit had a commanding view of the peaks surrounding Rogers Pass, as well as some unfamiliar ones to the north, possibly including Mount Sir Sandford, the Selkirks’ highest mountain. I sat around a bit, entered my name as the first of the year in the register (maybe the earlier party had turned back? ), then retraced my steps. I took a different line down the headwall, following some ledges climbers’ right of the corner, which seemed similarly difficult though less sustained. Below, I tried to cut the corner into my slide chute, but mostly lost on nasty mud and choss. After a bit of knee-deep postholing up high, I found perfect plunge-steeping in the couloir, followed by excellent boot-skiing in and out of the runnel where the slope eased. I managed to stitch together snow patches to within 100 yards of the road, then clambered awkwardly through brush and deadfall to reach the road. Back at the car by early afternoon, I drove up to the visitor center to see if they could recommend any other similar climbs. I spent some time talking to a friendly and knowledgeable ranger, but as expected, he could think of no suitable peaks that I had not already climbed. Oh, well — so much for Canada this year. Hopefully I’ll be back next summer, when I will need about a week to clean out the rest of the Rogers Pass area.